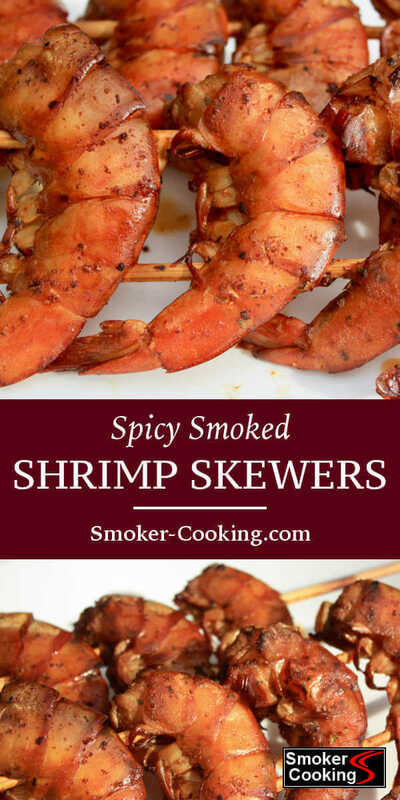 Tasty Grilled Shrimp Skewers Are Fun Little Appetizers! A ten minute snack. That's what these grilled shrimp skewers are. Easy to prepare and quick cooking, these grilled appetizers are a great tasting way to pass the time before the meal. 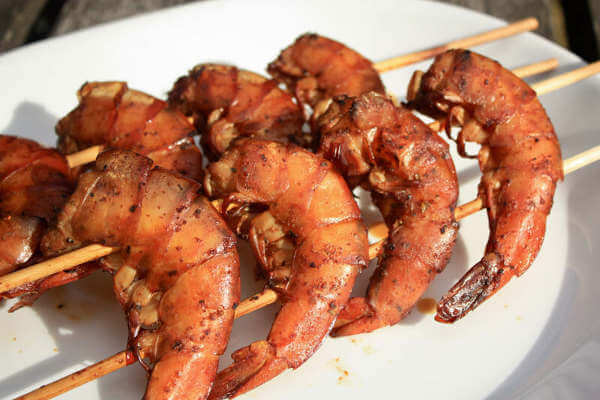 Flavored with a popular seafood seasoning and speared with bamboo skewers, you just pop 'em on a hot grill for a couple of minutes per side and they're done. For this recipe I used large shrimp, with a count per pound of 31/35. Each shrimp is about a half an ounce. Here's how to go about making this easy snack. First step, light the grill and crank it to high. Two pounds 31/35 size shrimp. Mix the dry seasonings together, then stir it in with the shrimp. Add the oil to the shrimp, being sure each one is coated thoroughly. Thread the shrimp onto the skewers and put 'em on the grill, over direct, high heat. If you want to grill smoke these little beauties, about 10 minutes before grilling the shrimp, toss a few woodchips onto the charcoal. Make a small foil pack filled with chips if you're using a gas grill. Don't use too much wood. Shrimp is delicate, and just a touch of smoke flavor is plenty. It takes only a couple of minutes per side to cook this size shrimp. If you use a larger size, give 'em a little more time. When the shrimp turn pink, they're ready to eat. Keep a couple of bags of frozen shrimp on hand, so when the urge strikes for a quick snack, you can whip up a batch of these grilled shrimp appetizers.